The weather looks like it will hold and provide a great opportunity to get on the water and experience some November fishing. It'll be cold, though, so pack some extra layers! The Yakima is on a drop right now and should stabilize over the next few days. 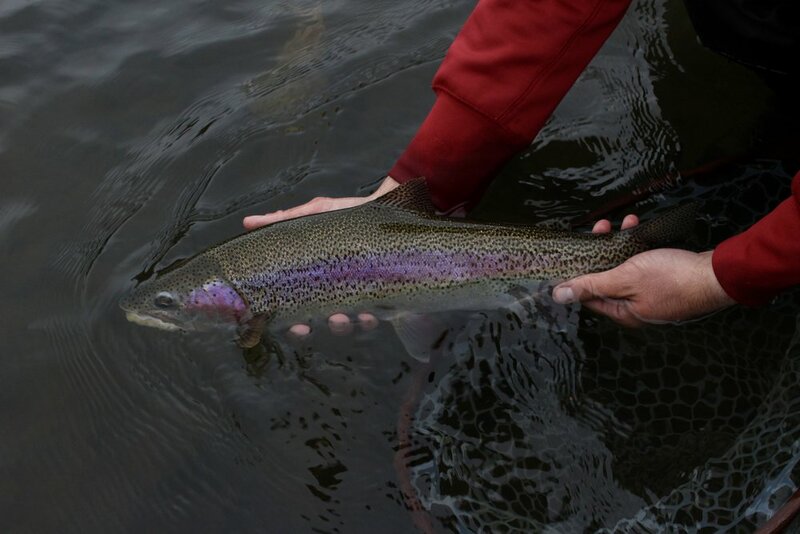 If you are experiencing off-color water, try fishing a bright colored flies. For nymphs, try fishing a Pat's Stonefly (#8-12) in coffee, black, brown, or orange/black. Try trailing the Pat's with a hot bead nymph (#14-20) like a pheasant tail or hare's ear. If the river begins to clear, try fishing lightning bugs or bwo-style patterns. Watch for dries to be coming off still in warmer periods of the day. Some mayflies can still be found with fish casually sipping them off the surface. Parachute patterns (#14-20) immitating bwos and mahoganies work well to fool these late season fish. Throwing flashy streamers with a large profile will help fish to distinguish your fly against a dirty background and debris in the water. Sparkle Minnows (#8) in olive or white can work well stripping in or swinging from the bank. Also consider trying Sculpzillas in black, white, or "natural" (olive/black) and fishing them the same way. Rocky Ford Spring Creek is also starting to fish well, so don't be afraid to make a trip to the desert this weekend. There is an abundance of fish in the creek right now that are happily snacking on scuds (#14-18) in orange and olive. These can be sight fished or drifted under an indicator. For those interested in tossing streamers, trying fishing a Sparkle Minnow (#8) in olive/white to trigger some very aggressive and heart-stopping takes. There's good fishing to be had right now. Make the most of your extended weekend and take a trip to your favorite body of water. Cast a line, take some pictures and enjoy some sunshine before we lose it during the winter.